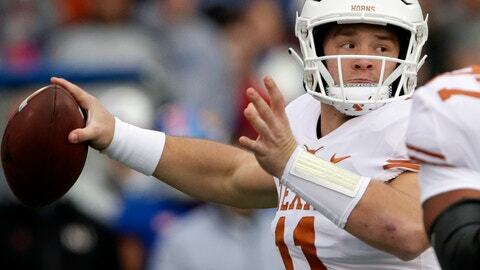 LAWRENCE, Kan. (AP) — Sam Ehlinger and No. 11 Texas made enough plays to put away Kansas. Texas (9-3, 7-2, No. 15 CFP) opened a 24-7 lead on Cameron Dicker’s 34-yard field goal in the fourth quarter, but Kansas responded with Peyton Bender’s 31-yard touchdown pass to Daylon Charlot and recovered the ensuing onside kick. Texas’ offense struggled for much of the first half, and then got back on track in the third quarter. Watson’s 31-yard run helped set up Andrew Beck’s 5-yard touchdown reception, and Ehlinger’s 3-yard TD run made it 21-0 with 1:02 left.